‘The Mermaid Port’ in English, Portmeirion is the most beautiful coastal village in North Wales. It was created by Sir Clough Williams-Ellis to resemble an Italian style village. He wanted to show that it is possible to enhance a naturally beautiful spot without spoiling it. Apparently he bought the site which was near his home town for only £5,000!! It is now owned by a charitable trust. Sir Clough developed the village in two stages between 1925 – 1975. It now consists of a beautiful hotel, a huddle of historic cottages, the piazza, a spa and an award winning restaurant. 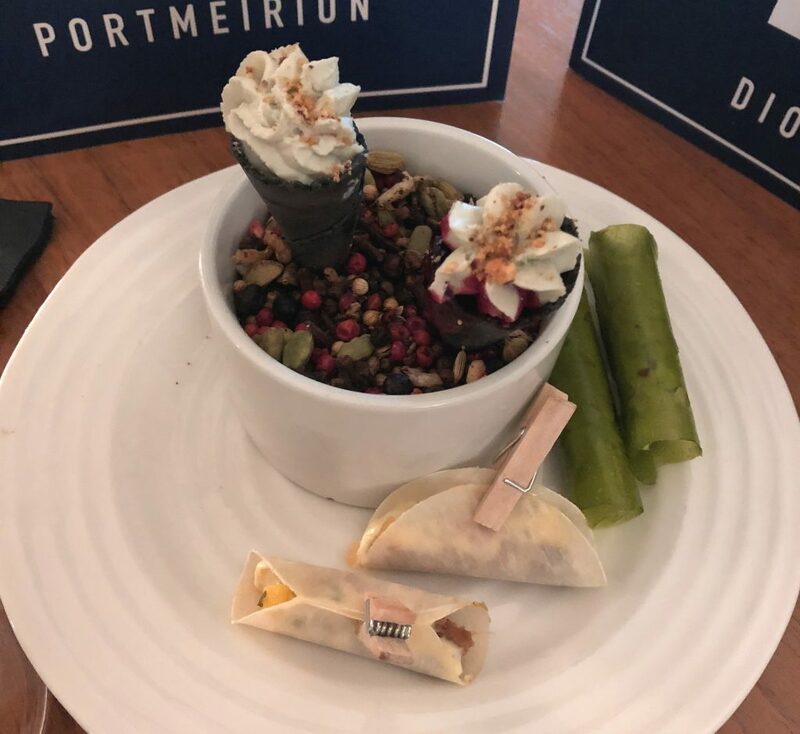 I can tell you from experience the restaurant in Hotel Portmeirion will be one of the best meals you ever eat! Driving up to Portmeirion feels like you can’t be getting anywhere close to the water or a gorgeous hillside retreat. You drive through quaint but very ‘normal’ looking villages until you turn off down what looks like a farm track. The track snakes and winds through the forest until it opens out to a stunning view of Castell Deudraeth. A little further through the forest you’ll find the car park and the main gate house. 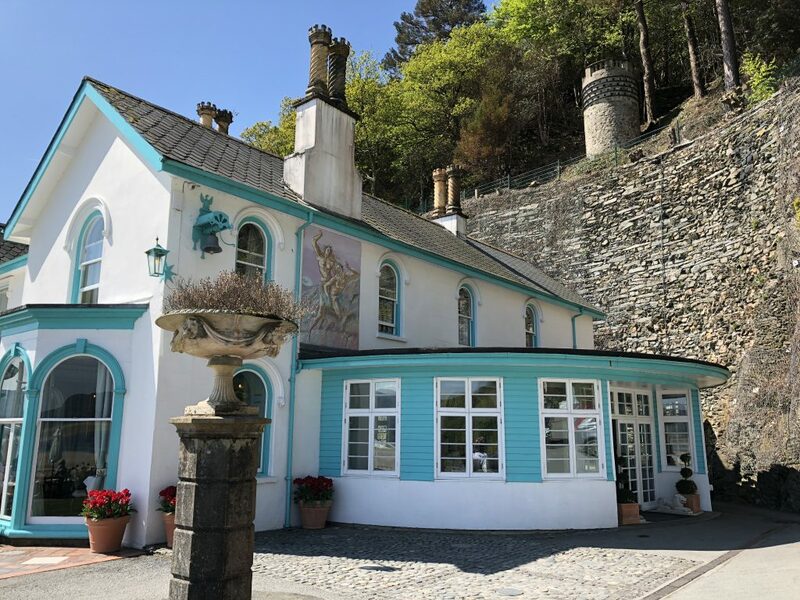 As we had booked an overnight stay in Hotel Portmeirion we were able to drive through the gate and village down to the hotel itself, the hotel is situated on the promenade at the bottom of the village hill. Arriving late afternoon meant most of the shops and cafes were closing but perfect timing to settle in to our room before dinner. Wake up to gourmet Welsh breakfast in Hotel Portmeirion. Smoothies served in tiny bottles, Alice in Wonderland style. Crumbly, melt in the mouth croissants and perfectly cooked fry up. All included in the room price. By the end of breakfast the sun had risen across the water and the mist was starting to clear. There was a little time before the village attractions opened so we ventured along the coastal path on one of the signed walking routes. The tide was out so all the patterns in the sand were visible and glistening in the sun. The path was comfortable to walk with the odd incline and breath-taking scenery. As it winds away from the coast back towards the village you pass through beautiful Chinese and Japanese gardens. There are a number of way points where you can choose what you see next. There is plenty to explore for those who love being close to nature. Conveniently the path we chose lead us back to the beautifully colourful Piazza and in to Caffi Glas. Being mid-morning the day had not reached its full heat but it was extremely pleasant to people watch in the sun with a drink or two. After a little pit stop there were numerous quaint shops to explore selling all manner of things from pottery to locally made chutneys and treats. 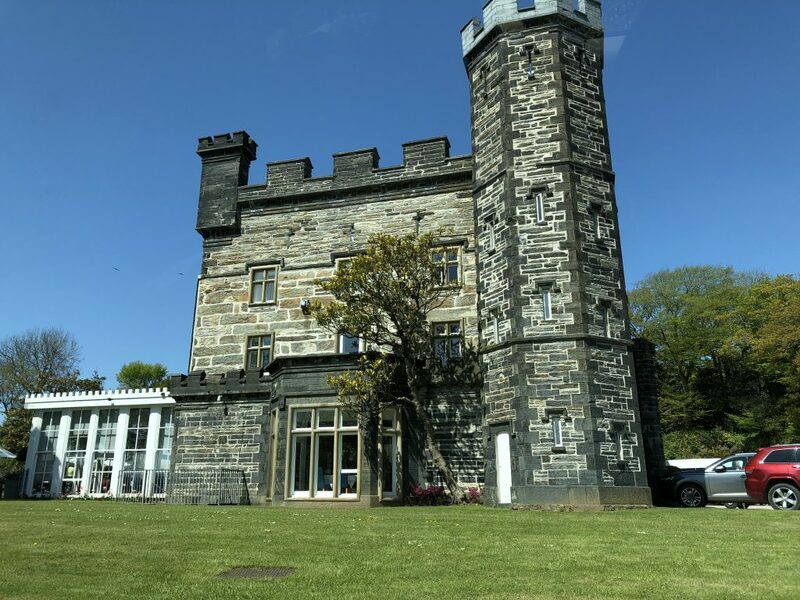 You can also visit the area where the set of ‘The Prisoner’ was & book in to the spa for some R&R. 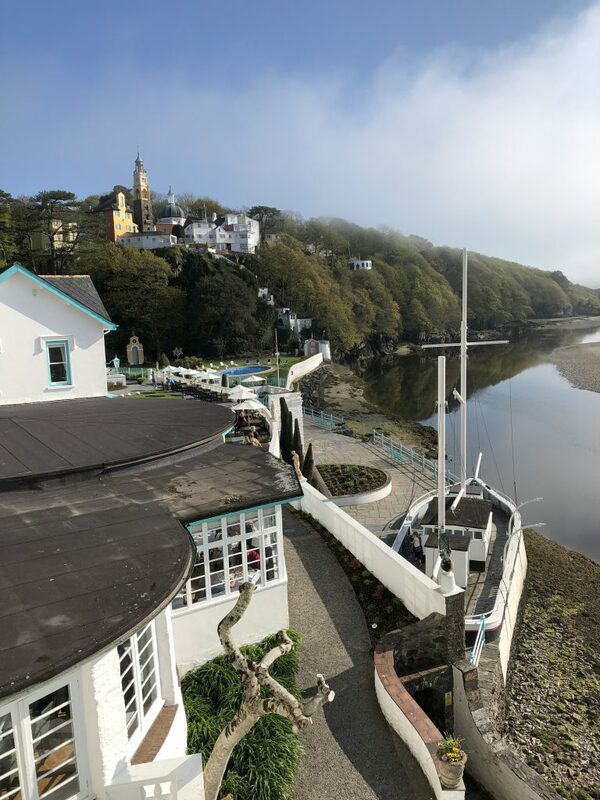 Staying overnight in the Portmeirion Hotel was a great experience and highly recommended. Aside from the amazing food in the restaurant we got to wake up and watch the misty coast turn in to a beautiful sunrise. 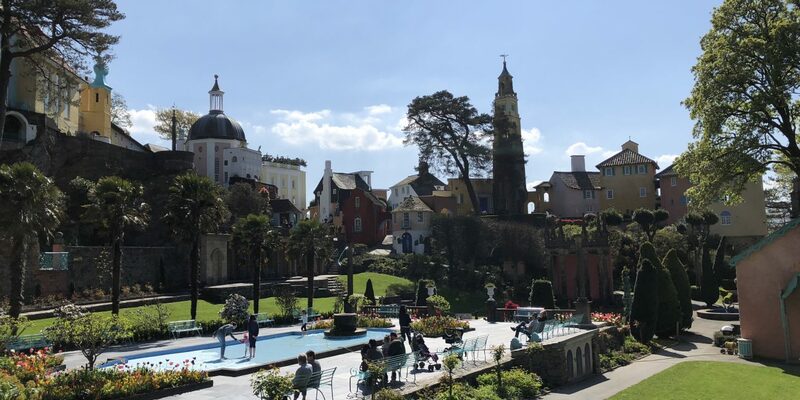 Also, Portmeirion is only open to day visitors between 9.30am and 7.30pm which means you get a little while in the morning to explore the grounds with very few people around. Between March and October you can join free walking tours from the main gate which takes around 20-30 minutes and were well worth doing. Our guide pointed out all sorts of bits and pieces that we would never have noticed while walking around alone. For example, some of the buildings’ windows are actually painted on! In order to keep their privacy they do not have real windows on certain sides but it isn’t until you look closely that you actually realise that. A true work of art. Only a select number of vehicles are allowed on site but there is free parking outside the main gate. This definitely adds to the charm as there is an allocated parking spot for every car. Day entry costs £12 for an adult ticket with £10.50 for concessions. However you can save a little off each ticket if you pre-book online. Children under 5 go free. Zipworld Velocity – The longest zipline in Europe and fastest in the world! For more ideas of places to visit in the UK and beyond check out my travel and lifestyle pages.